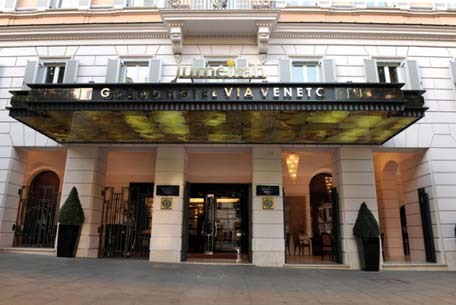 26/08/2013This entry was posted in Europe and Middle East, Hotel Reviews, Italy, Lazio and tagged Best hotels in Rome, Grand Hotel Via Veneto, Luxury hotels in Rome on 26th August 2013 by Anthea Gerrie. 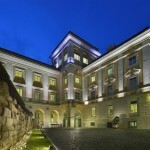 Guests in shorts would not feel comfortable in the uber-smart Grand Hotel Via Veneto Jumeirah, but not because of any outward disapproval from the staff. They may be the friendliest and most helpful hotel staff in Rome, their informality a counterpart to the slightly over-weening formality of the surroundings. Jumeirah style tends to be based on geometric motifs and a restricted palette; the result is slightly sterile elegance. But there has been formal elegance on this site for at least 2000 years; the site was originally the garden of the Roman historian Sallust in the last century B.C. In the 17th century it metamorphosed into a smart suburban villla for the nephew of a pope, and two centuries later was rented to the king of Italy. That sense of history is not really felt within the building, despite its protected facade; the theme for the interior of the Grand Hotel Via Veneto Jumeirah is Art Deco, with black granite floors, travertine stairways and glass chandeliers. Large helpings of Venetian Red lift the black and grey, bringing warmth to guestrooms or which more than half are suites, and there is warmth too in the profusion of rosewood, mahogany and makassar. 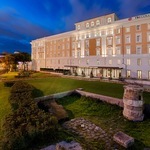 Acres of Carrara marble decorate spacious bathrooms furnished with Bulgari toiletries. Free wi-fi is welcome, but don’t expect a desk for your laptop; my room incongruously featured a central dining table, which took up a great deal of space, instead. The fine dining Magnolia restaurant was closed for dinner the night I stayed, but food at the casual all-day eatery, Time, which spills onto the pavement of the Via Veneto, far exceeded expectations. A “Caprese” of top-notch buffalo mozzarella and tomatoes was bettered only by an exquisite little grilled lobster, with an excellent Vermentino from the short but carefully-chosen list of wines by the glass. For alfresco imbibing, the rooftop Sky Bar offers views of this boulevard associated with La Dolce Vita with the aperitifs. Aqva, the basement spa, offers short massages to help arriving guests recover from their journey, as well as the full-blown ones, and facials using Bulgari skin-care products. There is a salt-water pool with hydro-massage jets, a hammam and a sauna. 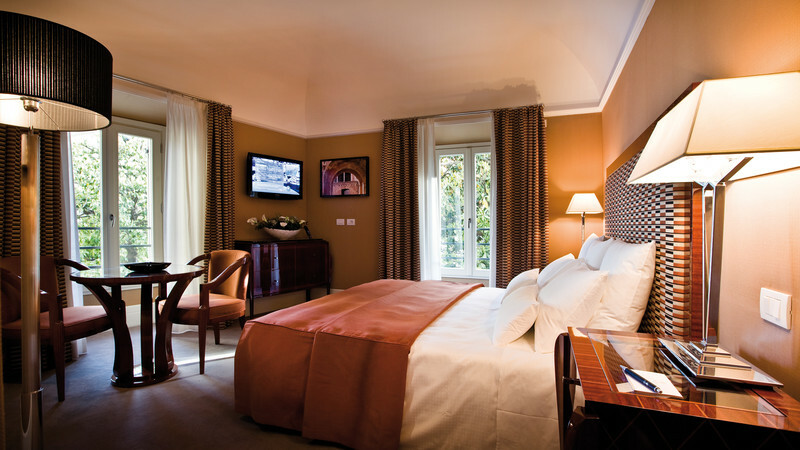 The great joy of the location is its proximity to Rome’s most beautiful park, the Villa Borghese. Attractions within include the Villa Giulia, with its priceless Etruscan artefacts, and it’s also possible to descend through the greenery to the exquisite Piazza del Popolo, one of the original gateways into the Eternal City.